We suggest all parents invest in themselves and their children. Luckily for us, the Government of Saskatchewan offers a free education program so your investment will be with your time rather than your wallet. Below is the 2019 schedule along with information of how to register. This is a 2 day program where children will be involved in activities and discussion concerning issues regarding separation and divorce. Topics explored will include: Family Changes, Feelings, Grief/Anger, Problem Solving, Self-Esteem. Group size will be 6 children. There is no cost for children to attend this program. When: Day 1; Thursday, February 21, 2019, from 1:00 p.m. to 5:00 p.m.
Day 2; Friday, February 22, 2019, from 9:00 a.m. to 12:30 p.m.
Parent Education Coordinator, Ministry of Justice, Family Justice Services, 306-787-8506. 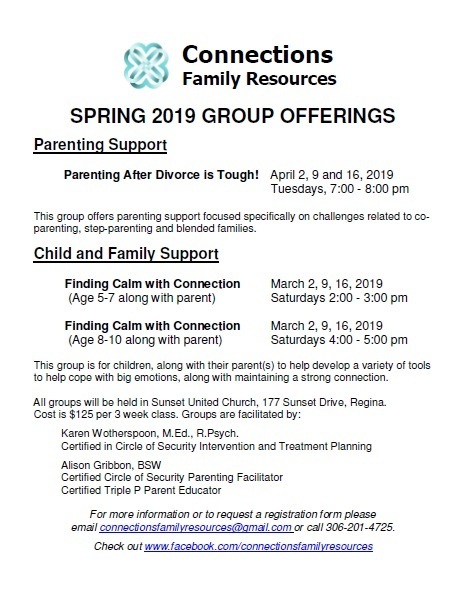 At least one parent needs to have taken the Parenting After Separation and Divorce information session, as offered by Family Justice Services, prior to their child attending this program. With Special Thanks: Caught in the Middle is a Program developed by Family Conciliation Services, Manitoba Families, Manitoba.